Earlier this May, the world had come to know Niloofar Rhmani, the first female pilot to graduate from the Afghan Air Force in thirty years. She graduated from Undergraduate Pilot Training and now works as a pilot at Kabul Air Base in C208 and C27 Battalion (Kandak). Afghan Air Force 2nd Lt. Niloofar Rhmani, Kabul Air Wing pilot, talks with Afghan Ministry of Defense officers before transporting them to Kandahar from Kabul International Airport, Afghanistan, July 18, 2013. On this day, Rhmani, accompanied by U.S. Air Force Capt. Aaron Marx, 438th Air Expeditionary Advisory Group executive officer and AAF pilot advisor, flew the first ever Afghan female fixed wing combat mission. 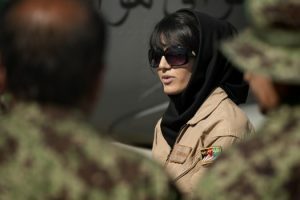 Twenty-one years old, the now 1st LT. Niloofar Rhmani grew up in Kabul, Afghanistan- a place that is in turmoil from years of war, unstable government, and limited women’s rights. Although Rhmani has a loving and supportive family, her childhood was bleak. “I have one brother and three sisters. I am really proud to have such a family that always support me and helped me…I grew up in Kabul and in Afghanistan was war and I haven’t had good childhood memory. I hope for a bright day in Afghanistan to see my family and my people to live in peace,” Rhmani said in an email interview. When she isn’t up in the air, Niloofar also enjoys playing the guitar. “It makes me really calm,” she said. In a country where women have limited rights and many lack education, Niloofar becoming the first female pilot in thirty years is an extraordinary feat for many Afghani women. According to a CNN report of a UN study in 2010, only twelve percent of Afghan women (fifteen years and older) could read or write. This is in comparison to thirty nine percent of Afghan men that can read or write in 2010. Only about forty seven women in Afghanistan make up the working force, compared to eighty six percent of men. It is in a country such as this that Niloofar was born, raised and educated. She explained how difficult it was to achieve her goal in a society that does not look favorably at women with unconventional careers. Niloofar’s inspiration comes from her father. He encouraged Niloofar to continue training and accomplish her ambitions despite opposition. “The person helped me to succeed in my dream it was my dad, and he is a good example in my life and my experience,” she said. Rhmani has achieved her dreams, but now she lives in fear for her family’s safety and her own. She and her family receive anonymous phone calls where they are threatened with violence. When she attempts to tell co-workers and others of the threats, no one seems to share her concerns. Some even replied saying to Niloofar that she should have thought about the consequences that comes with a female having an unconventional career in Afghan society. She added that she tried telling her commanders, General Wahab and General Barat, that she and her family were receiving violent threats, but no one seemed concerned or took any action. “I always try to tell my commanders…but nobody cares about me,” she said. The calls are made each time with different phone numbers, she added. Niloofar believes she has ‘enemies’ within the Afghani government and said that many individuals initially opposed her pilot training. Niloofar’s story is similar to the story of the first Afghani female rapper, Soosan Firooz. According to a BBC, last October, the north Kabul native, made her debut with a rap song about the war in Afghanistan and her hope for the future. The music video addressing female oppression and the pain of being a refugee went viral. Just as Niloofar receives violent threats, Firooz and her family also received threatening phone calls and text messages by anonymous persons. Soosan’s supportive father encouraged her to achieve her dreams and even quit his full time job to become his daughter’s bodyguard. Violence against women exists globally, and is an immense issue in Afghanistan. According to the CNN report, from all incidents recorded against women, thirty percent were accounts of women suffering from physical violence. These statistics do not include unreported incidents or an estimation of them. Niloofar pleads for help from any foreign organization, stating that no one in Afghanistan seems concerned for her and her family’s safety.